As an illustration major in art school one of our projects in Larry Carroll's illustration class was to illustrate a phobia. (Larry now goes by Lawrence.) I had never heard that there was a button phobia, I don't think that was on our list, probably because it is so rare. Thus, Koumpouno Phobia is the fear of button...as explained by Neil Gaiman in the video below. This past weekend, to celebrate Maestro Gregorio's day of birth, we went to see Coraline in 3D. Greg's fellow art buddy Dave McKean illustrated the children's book. 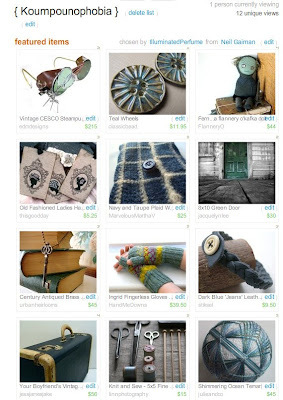 I created a Coraline treasury today for the Etsy main treasury. It is titled Koumpounophobia. "You are about to enter a world where everything you see has been created by hand." A couple years ago we had the fortune to visit Laika in Portland where Greg was being interviewed for a project. We were taken on a tour of the studio and got to see many where all the stop animation took place with all the drawers of items. The film is really terrific and I highly recommend it, however, it may be a bit too frightening for small children. The FilmFocus website has some fun games associated with Coraline, that's where I created the portrait of me above. Here is a video clip of Neil Gaiman, the author of the book, speaking on buttons. Now, back to the Koumpounophobia treasury. It began with the seed of an idea which too germination at the start of the film. However, when I began to hunt for items to place in the treasury things got convaluted. I ended up sacrificing content for beauty. The porcelain Teal Wheel Buttons are by Classic Bead in the Ozarks. Cheers to each of these Etsy shops featuring handmade and vintage items. Let's all intend this treasury makes it to the Front Page (FP) of Etsy. By the way, Etsy was featured on NPR today. Caroline! You know that's Coralines "other" name. How synchronistic. A pleasure to feature you. Thanks for dropping in.